We’ll fix your windshield chip or crack at no cost to you. Call us now and we’ll come to you. We can come to your home, office, or wherever is most convenient for you in the Greater Baton Rouge area and Denham Springs. With most insurance, your windshield repair is fully covered. Avoid costly replacement by choosing windshield repair, all at no cost to you. We stand behind our windshield repairs. If something isn’t right after our job is done, we will make it right. Our professional-grade resin is designed to bond your windshield back to its original strength, preventing further cracking. Windshield repair is 98% effective in saving the windshield. As soon as you notice a chip or crack, call us. We can repair your windshield damage before it spreads further. The key to windshield repair is fixing it fast, before it gets worse. 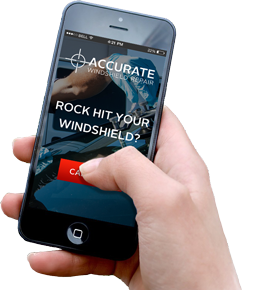 Accurate Windshield Repair makes it easy and stress-free by coming to your home or office, usually the same day. Our windshield repair process effectively bonds your windshield back to its original strength. Most insurance companies will waive your deductible for windshield repair and pay the full amount. We handle the call and all paperword to make it easy for you. The chip or crack is injected with a resin (glue) specifically formulated for auto glass. After cycling through several pressure and vacuum cycles the resin will have filled the damaged area. Next, an ultra-violet curing lamp is applied setting off a chemical reaction which causes the resin to quickly harden, bonding the windshield to its former strength.